Specificity :Anti-His antibody recognizes the N-terminal, C-terminal or internal 6X His-tagged fusion protein. 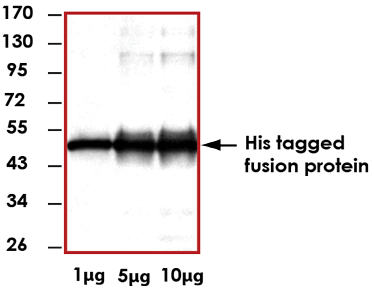 Sample Data :Representative western blot (1:1000) using in a positive cell lysate that contains His tagged fusion protein. Scientific Background :This polyhistidine epitope tag is generally comprised of six consecutive histidine amino acid residues located at the N-terminal, C-terminal, or internally . The 6 His-Tag is widely used because of its affinity to bind nickel or cobalt metal ions attached to sepharose, which can then be used to purify the protein in a native or denatured state . 2. Schmeisser, H, et al:, Binding Characteristics of IFN-alpha Subvariants to IFNAR2-EC and Influence of the 6-Histidine Tag. J Interferon Cytokine Res. 2006; Dec. 26(12):866-76.